We’re proud to manufacture the majority of our products in house. Not only does it give us control over the finish quality, it also enables us to create items bespoke to your exact specification. We’ve got plenty of space on site which has given us the flexibility to develop our off-site service which involves building an entire run of washrooms for clients to approve prior to design completion and installation on site. We’ve got plenty of storage space too so we can store finished products ready to be delivered to site just in time for installation, ensuring they reach you in perfect condition, exactly and only when required. The popularity of solid surface materials like Corian has increased steadily over the last few years and we’ve certainly witnessed a noticeable increase in large Corian trough vanities being specified within the office sector in particular. In order to meet the demand for bespoke vanities, duct panels and reception desks manufactured from Corian, we’ve created our own dedicated Corian workshop within the factory – giving our team of craftsmen all the space they need to manufacture bespoke Corian items for our clients. In addition to our Corian workshop, we’ve also got a full size spray painting booth. The five and a half metre wide dry backed invertor controlled spray booth has an internal height of three metres so that even the largest components, including cubicle doors, can be spray-painted to any RAL colour as part of our bespoke offering. 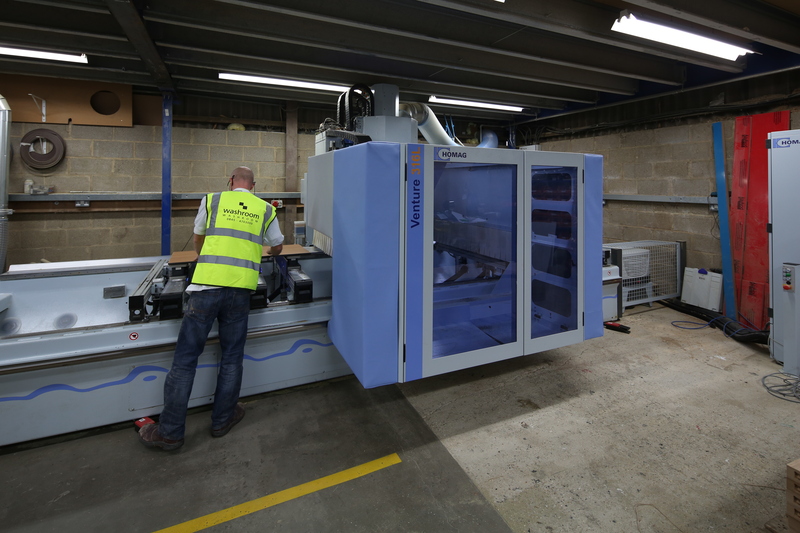 Our state-of-the-art five axis Homag CNC machine, which uses the latest CAD software to link seamlessly with our design department, together with our high-tech laminate press and edgebander, ensures we can deliver a quality finish on time, every time. And the whole factory is powered by our huge energy efficient biomass boiler, which is fuelled by wood offcuts and waste from the factory, helping to reduce our overall impact on the environment. You can download a copy of our new corporate brochure for more information about our range of products and services, or if you’re in the area, why not visit our new Clerkenwell showroom and meet one of the team to see how we can help meet your project requirements.